RewardBet N+1™allows you to precisely target any number of runners for 1st, 2nd, or 3rd in any position as well! And do it quickly and easily. Some peope call these 'bankers' and 'standouts' and it provides you with even more control over your betting to help you target more precise winners. Below the 'Stake-Submit' area you can enable (via Options) the "Show Selections Populate Control". This allows you to create banker and stand-out bets, the fastest way. Free To Help You Win More - Join In Seconds! Example. We like #1 and #2 to WIN with #3,#4,#5 to run 2nd/3rd place. Step 2 - Change Position Control to '2nd & 3rd' Select #3,#4,#5 runners. That's it! You have created your stand-out (#1 #2) bet. 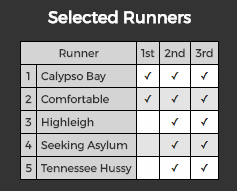 Note here we have our main runners also for 2nd/3rd (as selected 'any'). If you want them for win ONLY then choosing '1st' allows that. Any combination is possible. You can always confirm what your runners are in the bet preview before submitting. By using the Expanded Selection Picker ™ (shown above), you can easily select any combination of runners for 1st, 2nd or 3rd or even a mix. By default, any selection chosen is bet to hit any placing, but clicking the 1st, 2nd or 3rd icons you can narrow down the bet placement. The main rule to remember is that your selection must fill the position you nominate (eg 1st, 2nd or 3rd) for it to contribute to your winning bets. If in doubt, peruse the 'bet preview' selections to ensure your selections match your bet expectations before you submit your bets.